Cherries are tricky in Southern California. Only a few varieties will fruit here with our relatively warm winters. Six winters ago, I planted two cherry trees for my mom in her backyard. The two needed each other in order to fruit. The flowers of Minnie Royal could pollenize the flowers of Royal Lee, and vice versa, but either tree on its own would be useless. After a couple years, the trees started pollenizing each other and making cherries. How cool! Cherries in Southern California — right next to avocados . . . until one of the cherry trees began to decline in health. It had a large crown gall; it soon died. The remaining cherry tree was now a mere ornamental. Cherry on right with white flowers. Doing this would, in fact, be like returning a favor to my mom. In 2015, in my own yard, I planted a Dapple Dandy pluot tree, a tree which needs another tree to pollenize it just like the cherry has its pollenizer need, and I took a branch from my mom’s Burgundy plum to graft in and do the job. It worked swimmingly. Fruit that had to be thinned from the Dapple Dandy pluot tree, after being pollenized by Burgundy plum. But why didn’t I just buy and plant a Burgundy plum tree near my Dapple Dandy pluot? Unlike in my mom’s yard, I had the space. For me at the time, it was mostly because I didn’t have the money to buy an additional tree. In other cases where I’ve grafted pollenizer branches into fruit trees, it has been because I didn’t want an entire tree’s worth of that particular variety’s fruit. For example, I grafted a branch of Pinkerton avocado into my Fuerte tree. I already had a Pinkerton tree on the other side of my yard. I didn’t need another Pinkerton tree; I just needed some of its flowers to pollenize the Fuerte. So there you have three reasons to graft pollenizer branches into fruit trees: One, it saves space compared to planting a full pollenizer tree. Two, it saves money. And three, you may not want the fruit of the pollenizer tree, just the pollen, thank you very much. 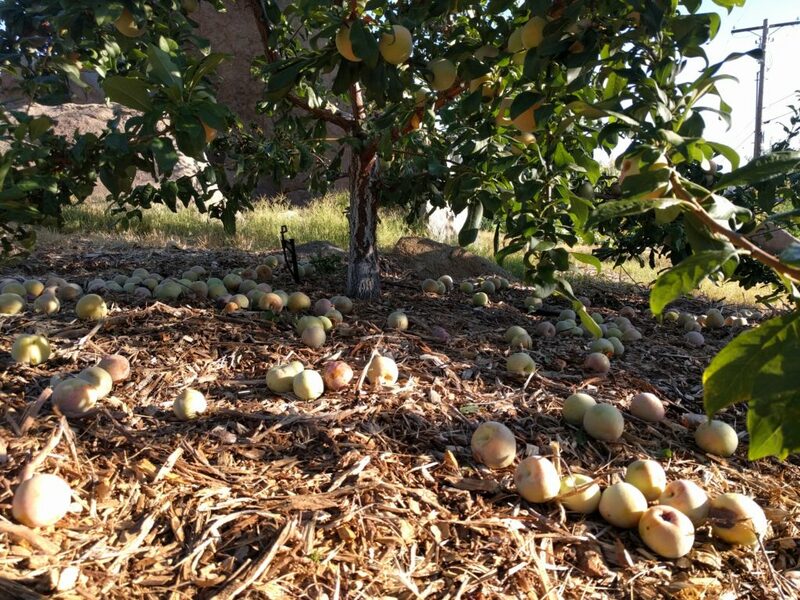 Which kinds of fruit trees need pollenizers? 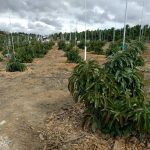 And there you have three different kinds of trees which can benefit from having pollenizer branches being grafted in: cherry, pluot, and avocado. There are others: apples and pears, for instance. However, not all cherry varieties need pollenizers — same with apples and pears. 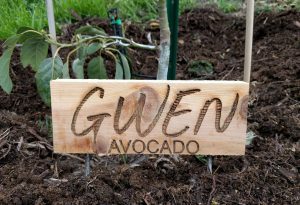 Avocados never need pollenizers to produce a crop, only to bump up production. And there are some types of trees that have absolutely no use for a pollenizer: peaches, nectarines, and citrus come to mind. But if you have a tree that can benefit from a pollenizer branch being grafted in, how do you go about it? The actual grafting techniques are beyond the scope of this post though I will share some links to help with that at the end. Here I’ll just share my experiences with choosing a pollenizer variety, possible sources for finding a pollenizer branch (scion wood), and which part of the tree to graft it into. 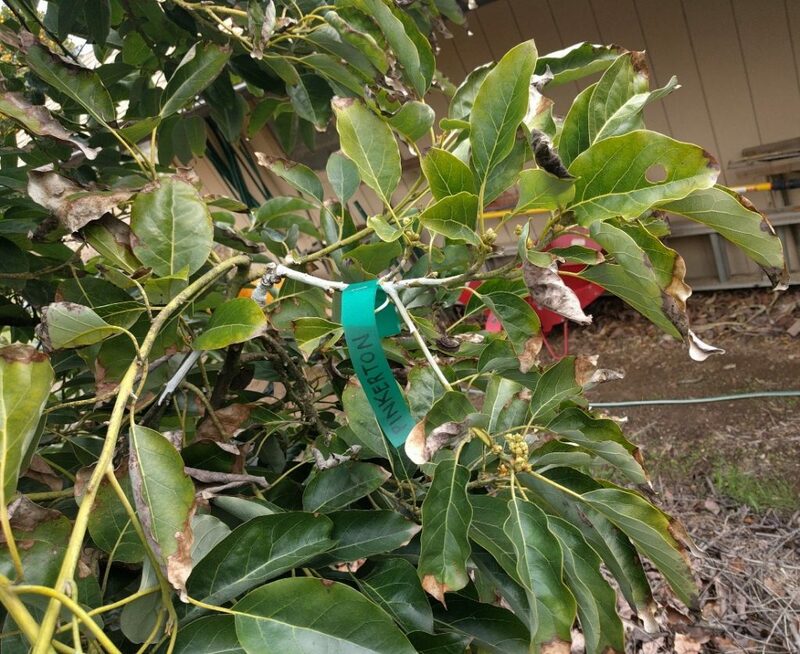 For cherries, pluots, plums, apples, and pears, find a variety that will pollenize your tree by referring to the tag that came with the tree and look up the page for your specific tree on the Dave Wilson Nursery website (growers of most of these trees sold in Southern California). That’s actually a bit confusing, isn’t it? 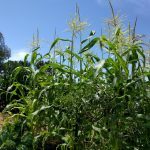 Often, you’ll find somewhat different information about pollenizer varieties from different sources. Unfortunately, I’m not aware of a single authoritative resource on this subject. But in addition to the tag and Dave Wilson site, I’d refer to the Sunset Western Garden Book. Similarly, for avocados there is no great single resource to help with choosing pollenizer varieties. In general though, you want to choose a variety of the opposite flower type and one that blooms most synchronously with your tree. 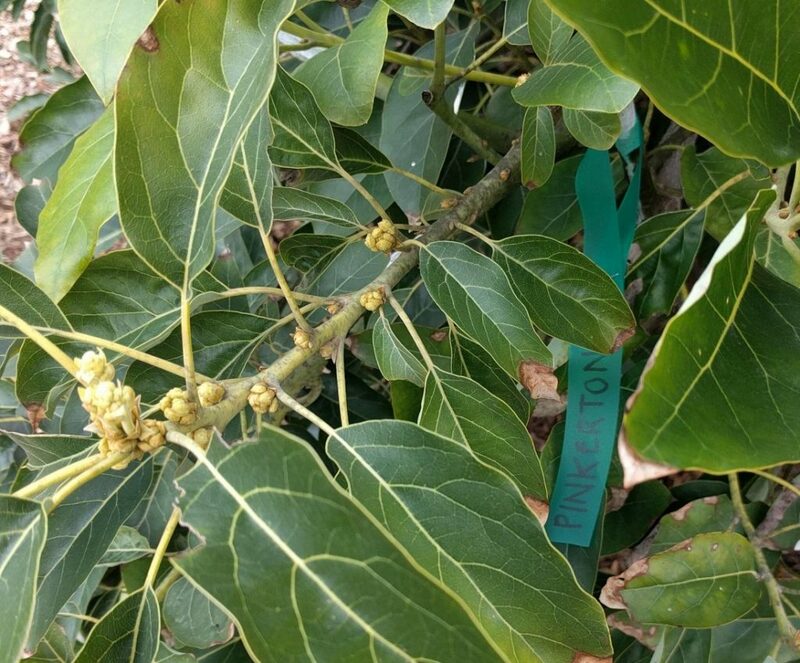 With my Fuerte, for example, I chose Pinkerton because it is an ‘A’ while Fuerte is a ‘B’, and they are both somewhat early bloomers relative to other avocado varieties. Pinkerton passing the “cauliflower” stage of bloom here in mid-February . . .
. . . at the same time as Fuerte. 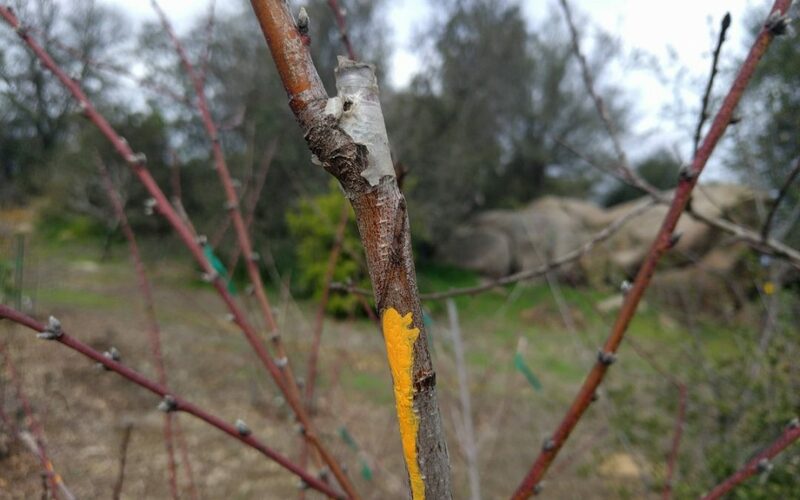 If your fruit tree is small, say in its first year or two in the ground, then you can likely graft the pollenizer branch into any quadrant or level of the tree and get successful long-term results. I grafted Burgundy plum into my Dapple Dandy pluot tree during the very winter that I planted the small tree. 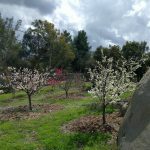 I grafted the Burgundy plum branch in a low spot on the east side of the tree, and it has flowered well and therefore pollenized well, as seen in the abundant pluots I’ve had to thin. Incidentally, the Burgundy plum branch itself has fruited a little too profusely. In my experience, having a pollenizer branch within the main tree seems to engender better pollination even compared to planting a pollenizer tree nearby, let alone relying on the pollen of a neighbor’s tree. If you watch how bees fly, this will make sense. They like to feed on the flowers of one tree at a time, for the most part, rather than flitting from one tree to another. My own Fuerte avocado tree was already large when I grafted in the Pinkerton branch so I placed it at eye level on the south side of the canopy. I did this because I wanted to make sure the Pinkerton branch got ample sunshine. The north side or very bottom of the canopy of a large tree would not be good locations to graft in a pollenizer branch because they are the shadiest. 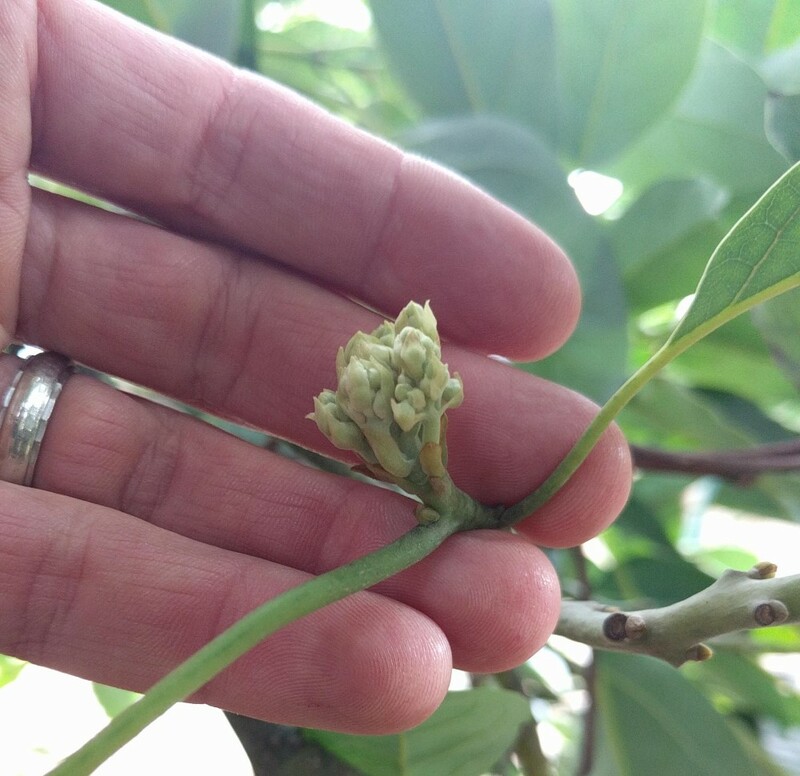 Remember that you need this branch to flower abundantly in order to provide pollen to the flowers of the main tree, and the grafted branch will only flower abundantly if it gets sufficient sunshine. If you’re trying to keep your main tree pruned to a limited size, then you may also want to avoid grafting in the pollenizer branch at the extreme outside of the canopy. This branch will need to grow a couple feet in order to produce flowers for pollination. Don’t place it where you can’t allow it to expand like this. Over the years, you will need to maintain the pollenizer branch’s access to sunlight. This may require pruning back some branches of the main variety if they grow over and smother the pollenizer branch. I’ve had to do this a bit with my Dapple Dandy branches since Dapple Dandy is a more vigorous grower than Burgundy plum. Can you even see that little plum branch in there? 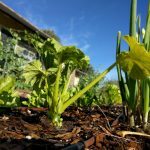 Does the idea of grafting intimidate you? No problem, provide pollen for your tree in other ways, such as by planting an entire pollenizer tree. You can also buy multi-grafted trees, of course. Does the idea or utility of grafting fascinate you? Then here are some resources that I’ve found helpful. 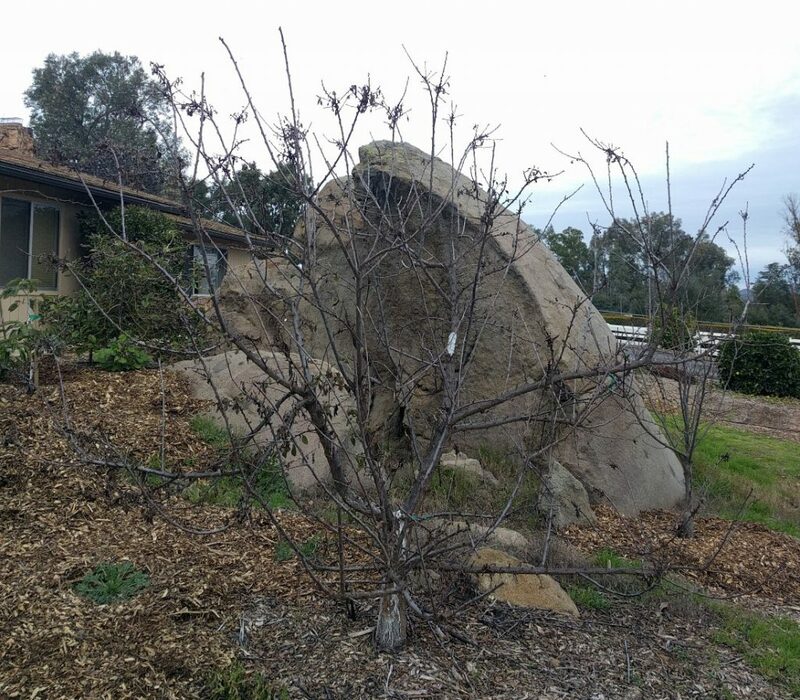 For grafting deciduous fruit trees, see these resources by Chuck Ingels. He wrote and edited the book, The Home Orchard, which has an excellent chapter on grafting that is full of photos. Also see this slideshow on grafting that Ingels made. For grafting avocados, the best resource is Propagating Avocados. Your fruit tree is grafted — Why? And so what? Great article! 5 years ago I grafted to both the Minnie Royal and Royal Lee. I just planted a Royal Crimson cherry because it is self fertile. 6 years ago I bought a Hood Pear and a Florda-home pear and grafted those to each other as well for the very reason you stated, so if either tree dies I still get fruit. A large Fuerte that hardly produced anything had about 120 large avocados this year along with Hass and Reed that I grafted to it due to the better pollination. So, I absolutely validate your article for those reading here. I’m in Del Cerro and my Pluots are not doing well here. They bloom during the winter and then in spring the buds are mostly gone. I planted 5 varieties in a big hole, so that their limbs cross each other, but when the buds open too early the fruit is not happening. I love Pluots! Your production in Ramona is amazing in the picture you put up! Flavor Queen Pluots have been on one of my trees now for a couple months and are the size of marbles and will just fall off. If you have a solution I would love to hear it. I have Flavor King, Flavor granade, Emerald drop, Dapple Supreme, Flavor Queen, and my Dapple dandy died, so it is gone. Awesome feedback, Rick. Thank you for this. As you know, it’s colder on winter nights here in Ramona compared to Del Cerro. So when I have to protect my avocados this time of year, I try to console myself with thoughts of the pluots, etc. that this chill helps provide. We need a fruit transfer tube so you can send a few Fuertes up this way, and I’ll send some Dapple Dandys your way. Truth is, last year was a bust for my pluots too. Production was pretty low. Last winter was extremely warm, which was the main cause, I think. I got fruit, but nothing like normal. I only have three varieties though: Flavor King, Dapple Dandy, and Flavor Grenade. The best producer last year was Flavor Grenade. It seems to me that Flavor Grenade produces with less chill than the others based on this, plus the fact that my mom’s Flavor Grenade tree does very well and her yard is warmer in winter than mine (L.A. County, Sunset Zone 21). 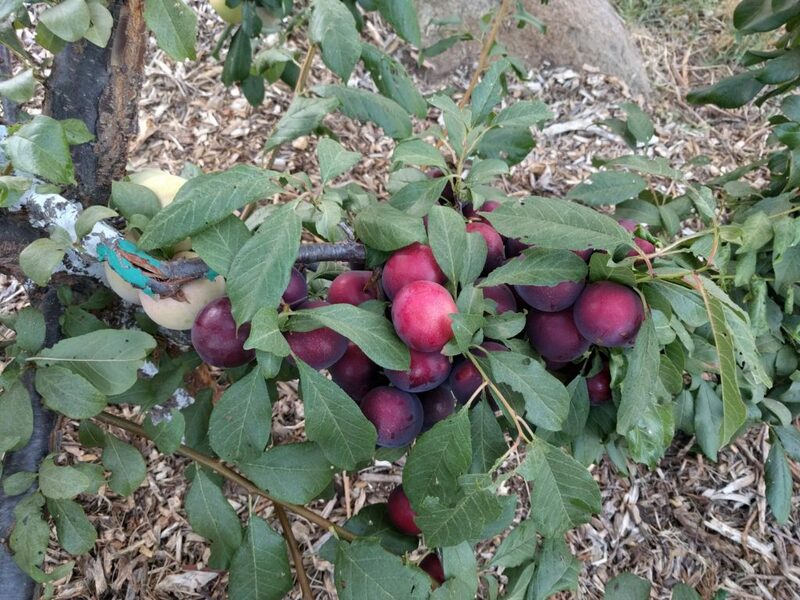 I’ll go back to some notes I took on pluots a while back, and I’ll ask around to people I know who grow them throughout Southern California, and I’ll update this comment thread as soon as I can. Maybe we need a full post on growing pluots in Southern California. They are so amazingly delicious! Is anyone else reading this able to contribute their experience growing different pluot varieties? 9 varieties of pluot here by SDSU. My 4-1 (splash, geo pride, emerald drop, flavor grenade) hasn’t produced much in a few years. The flavor grenade branch always stayed small so I cut the whole thing back to let it start over and force it to equalize. Last year we planted a 4-1 (flavor queen, king, supreme, dapple dandy) to see what would happen. You can’t find that combination in San Diego due to high chill hours but I didn’t care and wanted to see what would happen. The 9th pluot is a flavor finale (another high chill hour variety). It’s got some tiny buds on it this year so let’s see what happens. The typically warm January set a lot of my early stone fruits into bloom (I’ll be thinning Florida prince peaches and desert dawn nectarines soon) but the pluots are barely waking up. Hopefully some of them provide fruit this year as they’re my wife’s favorite, especially the Emerald Drop. Thanks so much for that, Bob. I’ve only had Emerald Drop from a farmer’s market vendor, which is like having never tasted one at all! I knew this because the vendor’s pluots of varieties that I grow in my yard were also not very good — not good like I know they can be. I guessed they were all picked prematurely. But I really liked the color of Emerald Drop. May have to plant a whole tree if you and your wife like the flavor a lot. You don’t have any plums in your yard, do you? The Flavor Grenade trees I know (including my own) are also not vigorous compared to, say, Dapple Dandy or Splash. For me, Flavor King is another slow growing one like Flavor Grenade. My pluots are all still barely waking too, except the Dapple Dandy has a handful of early open flowers. Have you noticed (or do you notice this year) a general order of bloom in your different pluot varieties, especially if one is always earlier or later than the others? I’ve got a Santa Rosa, Burgundy, and Satsuma plum (all sound asleep). The Emerald is in full bloom and the Geo Pride and Queen are swelling. All of the other pluots are sleeping in. I used to keep good notes of bloom times but don’t anymore but have noticed that there are definite early risers while some flower much later. That being said, some of my peaches and nectarines are past flowers and have set fruit but other varieties are either dormant, swelling, or full bloom; and there’s good leaf growth on some of the earliest varieties. I agree that pluots are good, however, one of the best tasting stone fruits we have over here is definitely the Arctic Star white nectarine (comes in mid to late June). These trees are all backyard pruned to what I can reach and aren’t too far from each other. We’ve never had a problem with pollination in large part due to the fact that my neighbor and I don’t care that there’s a feral bee hive in the fence. Sounds like you’ve got an abundance of pollenizer and pollinator options going. And I’m jealous of the feral bee colony you’ve got there! Good to hear your review of the Arctic Star nectarine. It so happens that I grafted a branch of that variety onto one of my peaches last week. I have a young “Fig” tree (5yrs old), any thing I could graft to it?? PS: The figs are really good. As far as I know, you can only graft other varieties of fig to a fig tree. But it is a fun idea to have a multi-graft fig tree with many varieties since figs come in so many flavors, colors, and sizes. Do you know which variety yours is? thanks for this article. i actually ended up having to purchase 2 trees (flavor grenade along with a santa rosa plum tree) since i wasn’t able to acquire any scions around me… and the plan is to plant the FG and graft a SR scion onto it like you described. that’ll help save some room in the backyard and i might then add a FG to the potted SR as a backup. Smart idea, Johnny. Please let me know how well the Flavor Grenade fruits being pollenized by Santa Rosa plum. It seems it should do very well. Absolutely, Eric. It so happens that I’m headed to a friend’s house this afternoon to graft a rootstock sucker for him, just as you described. 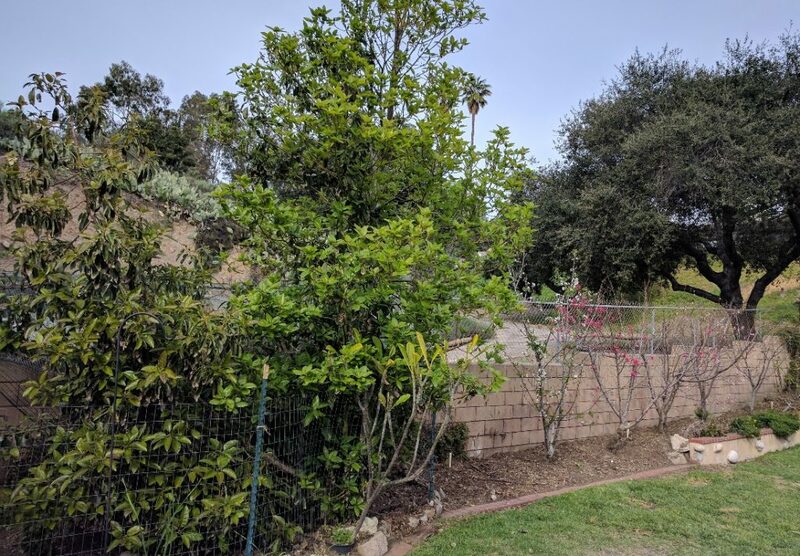 We recently bought a house in Paradise Hills that came with a gloriously large avocado tree (probably 30ft tall by 20ft wide). I think it is a Reed variety (because of the large, round fruits with very thick skin and yellow flesh). It had nearly a dozen fruits on it when we bought the house in October. But now there are only two avocados on it and no signs of any fall set. If I were to plant a cross pollinator or try to graft a pollinator branch (can I even do that on a tree that established? ), what would be the best variety? If your tree is a Reed, then it should start flowering sometime around now (early April) and will go into June. Reed is a late bloomer. I’ve never met a Reed that needs a pollenizer. Reeds set lots of fruit without one. But if I were to choose one for a Reed, I would consider Fuerte since its bloom also usually lasts at least until May. You can graft in a branch on even the biggest of trees, but it’s best to choose a spot that is sunny, such as on the south side of the canopy.